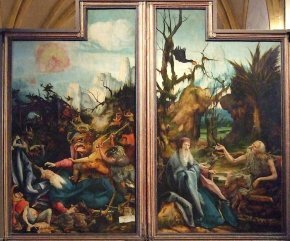 24/4/11 – Restoration – Colmar, Musée Unterlinden - The Issenheim altarpiece is one of the most famous museum works in France, in itself a symbol of the Musée Unterlinden in Colmar, also known for its rich collections of Germanic art from the Middle Ages and Renaissance. The recent announcement that the polyptych by Mathias Grünewald will soon be restored will therefore leave no one indifferent. 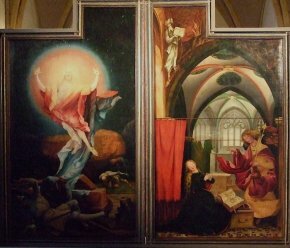 Thanks partly to funding by the Fondation du Patrimoine, the altarpiece will have the upper layers of varnish removed and also clear away“certain awkward repainted areas marring Grünewald’s work which mask the original composition […] (for example the starry sky in the Resurrection (ill. 2) and in the same panel, the presence of the soldiers in the background which are today invisible)”. The operation will take place in public so as not to deprive visitors from seeing it nor would it be wise to move it from the chapel where it was installed in 1945 and resides in the necessary conditions ; differences in temperature and humidity between summer and winter are “tempered by the thickness of the walls and the inertia of the air due to the volume of the room”. As stated in the press release, this is in no way a fundamental restoration. The polyptych is in fact in good condition. True, “the varnishes have yellowed significantly and are altered, resulting in many irregularities and places where they have run, thus considerably distorting its view close up, as well as at a distance, and eliminate much of the luminosity of a frank palette, often composed of primary shades, much used by Grünewald to represent with just a few frank and spontaneous brushstrokes savory details, mostly situated at the second level. These layers are often deteriorated and thus also diminish the depth and perspective : the skies, originally in a limpid light blue are now yellow and no longer serve as the “vanishing point”. Carried out by restorers used to working for museums and under the supervision of a scientific committee, the restoration will no doubt proceed with utmost caution. We do however wonder at the cost of the undertaking, estimated at 340.860€ tax included , presumably justified by the size and number of the panels but nonetheless quite high given that they do not look in poor condition. Such a decision must have required quite some determination. Only the results will tell if such a price was truly justified. We can only hope that it will be as successful as the precedent recently set by Rembrandt’s Pilgrims at Emmaus (see news item, in French, of 5/4/11). Besides the 100.000€ provided by the Fondation du Patrimoine, the government will also participate via the DRAC Alsace and Région Alsace for a total of 80.000€ ; another 10.860€ have been contributed by the Schongauer company. There remains 150.000€ still to be found, most likely through private patrons.